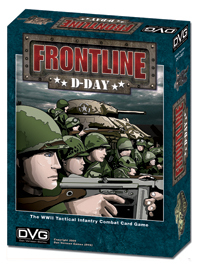 Frontline is a tactical WWII ground combat card game for 1 to 4 players. The game covers small unit action during the D-Day beach assaults and the steady stream of conflicts as the Allied troops advanced toward Germany. Each player commands a squad of 5 to 12 British, American, or German soldiers and vehicles. Each card represents one soldier or vehicle. Each unit has inherent actions each turn including moving and attacking with different modes of fire. An action card deck enhances basic actions, and provides units with spur of the moment options.